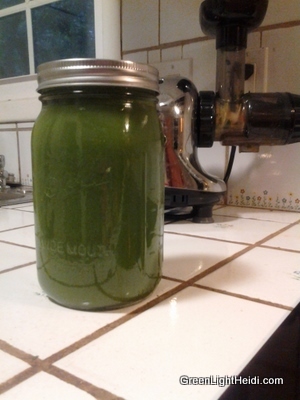 In the baggie is nopal cactus which is supposed to help with inflammation (juiced a 1/2 cup). Then we have one stalk of organic celery, 1/2 bunch of organic spinach, one apple, 3 carrots, 1/3 bunch of organic cilantro, 1/3 bunch of watercress, one large cucumber, one lemon with yellow skin taken off, and thumb-sized piece of ginger. I put it in the juicer and voila!!! I drank about half of it to fit it into that jar! 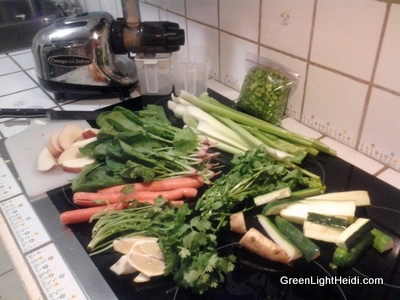 If you are a newbie to making juice, consider buying a used Champion juicer on ebay for like $25, you can order all the replacement parts for less than $100, (the blade is $36,) and it makes great juice–particularly for carrots and apples, (more bulky foods). 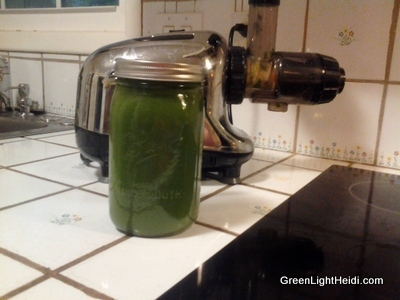 The juicer I’m using in the photo was designed for greens and I decided to buy it after I’d gotten into juicing and was ready to make the hefty $200-$300 commitment.